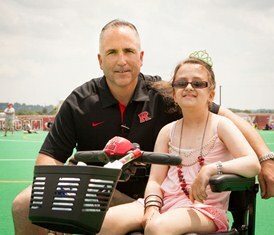 EASTON, PA (June 10, 2013) – Lauren’s First and Goal is honored to welcome Rutgers University head football coach Kyle Flood to its Honorary Board of Directors. Flood visited the foundation’s football camp at Lafayette College on June 2 and addressed the more than 2,000 high school athletes in attendance. He joins other college coaches including Penn State’s Bill O’Brien, Ohio State’s Urban Meyer, UConn’s Paul Pasqualoni, and Maryland’s Randy Edsall on the Lauren’s First and Goal board. John Harbaugh, head coach of the Baltimore Ravens, is also an honorary member. These gentlemen will help to promote Lauren’s First and Goal’s mission of providing financial support for brain tumor research and cancer services, offering financial and emotional support to families living with pediatric cancer, and increasing awareness of the disease. This year’s annual high school football camp in Pennsylvania set a new fundraising record, tallying more than $104,000. Since its creation in 2004, Lauren’s First and Goal has raised more than $1.5 million. A second high school camp is scheduled for Saturday, June 22 at Otterbein University in Westerville, Ohio.